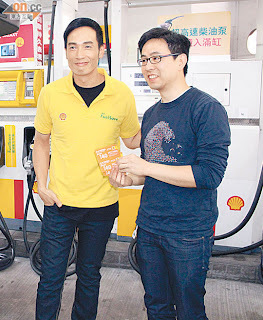 Yesterday when Moses Chan attended Shell's "FuelSave" event, he disclosed he will comply with the traffic regulations and definitely won't speed. However, he exposed he had no patience and tolerance in the past. He had a bad habit of cutting lanes when he drives. Moses said: "I used to cut lanes all the time, one the driver that I cut in front of, actually stopped his car and told him 'One person per lane, one space per person'. I really thank him for reminding me." Moses added his girlfriend Aimee Chan is a safe driver, but many times he would be her driver. When speaking of Yoyo Mung terminating her TVB contract? Moses expressed: 'I heard that too, but first I want to congratulate her on her marriage and I'm not too sure about her work, but I do hope she has good development."